The CoolGrandma.com Online Community - a comprehensive destination site for everyone cool - adults, parents, seniors, grandparents, and their children! Tutorials, articles, health, chat, free email, free membership, website directory, and more! Welcome to CoolGrandma.com! Thank you for joining us here on our website as we explore the web and all it has to offer. As a community, we openly invite you to join us on our journey of learning, interacting, and sharing on the Internet. All of the resources you will find on our website are free, so please don't hesitate to navigate around our site. The CoolGrandma.com website is for people of all ages, seniors, parents, their children, and anyone else who is inspired by the boundless limits of the web. 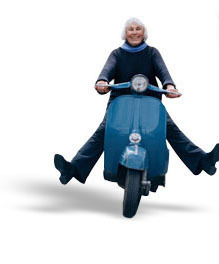 Our mission is to empower the online senior community and have fun doing it! Can Anti-Depressants Affect Bedroom Behavior?